This one is close second, because it has all the features as the #1 calculator, however it calculates taxes as soon as you enter the amount or change the options. In our experience we would like to change the amount and/or options first and then see the results, so we can compare stamp duty on the spot. 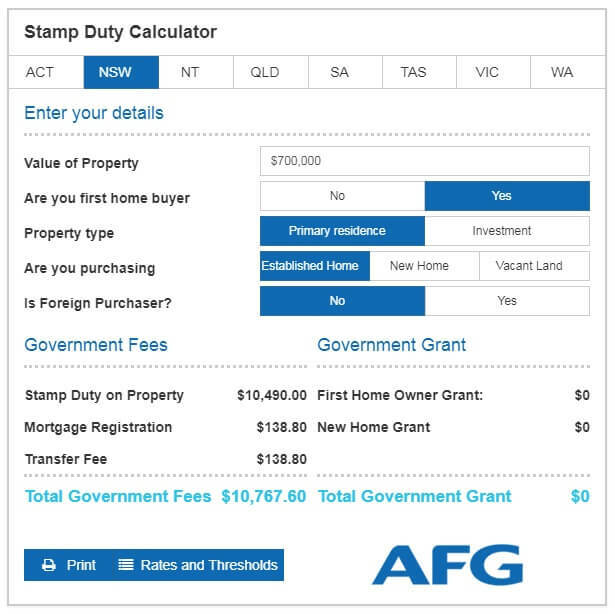 Aussie home loans comes #3 with its' stamp duty calculator. 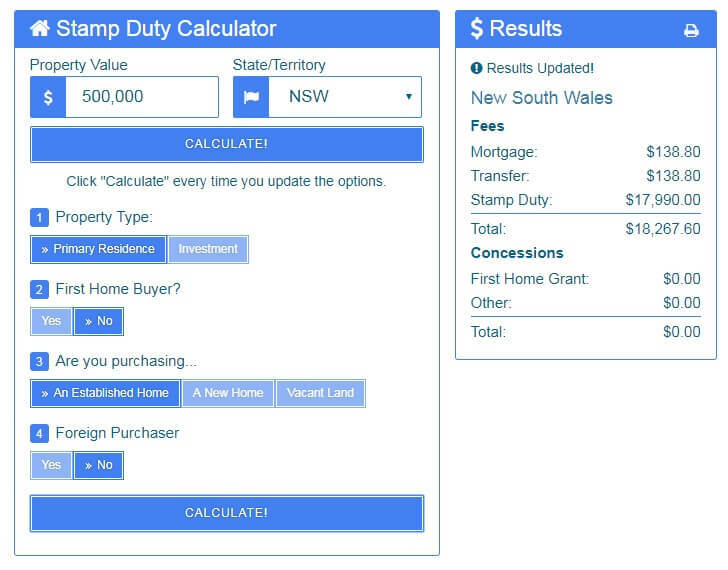 It does not have all the available options to calculate stamp duty and on mobile devices the results are not showing. Poor form! 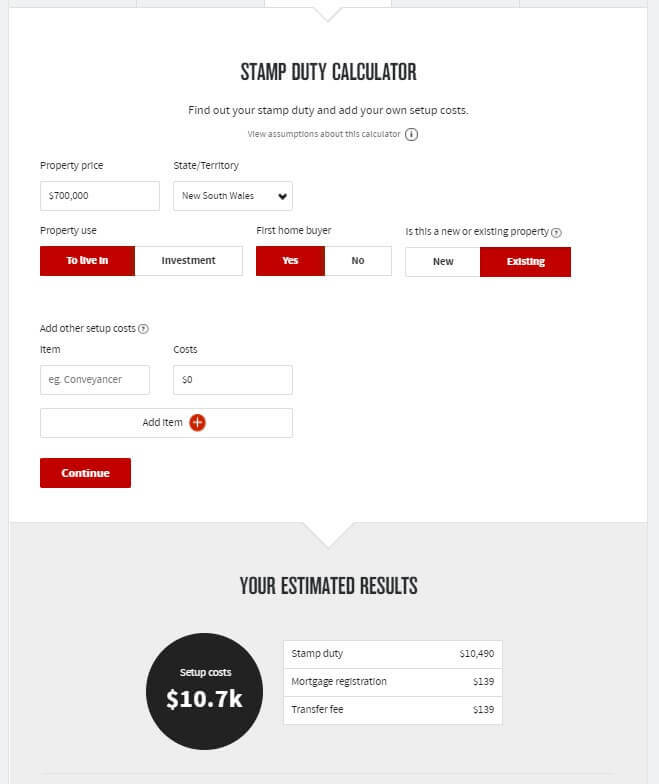 NAB stamp duty calculator comes as #4. It does not have all the options, it uses rounded numbers and has annoing way to display the results - it jumps to the section below. So if you want to run multiple calculations you have to scroll up every time. 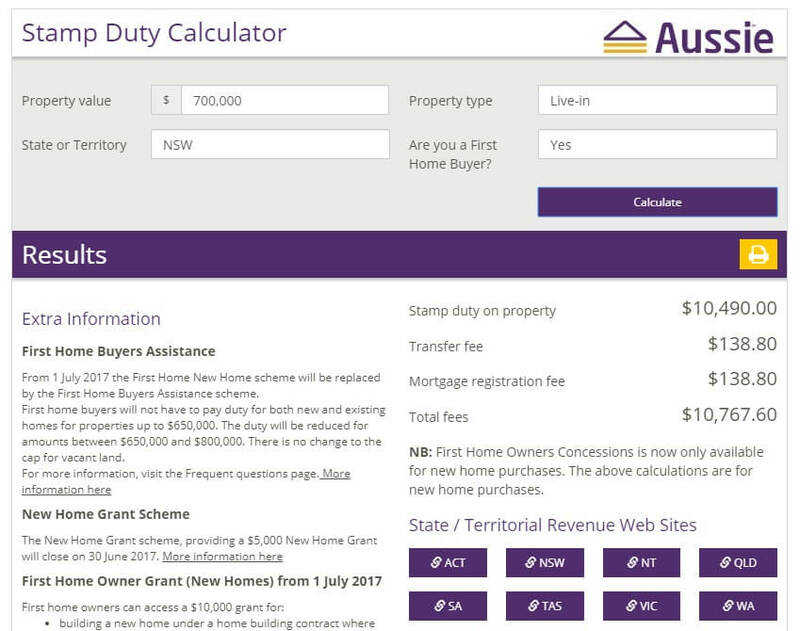 And the last on the list is realestate.com.au stamp duty calculator. It also does not have all the options, but the worst thing is it's NOT updated with the latest rates and changes! 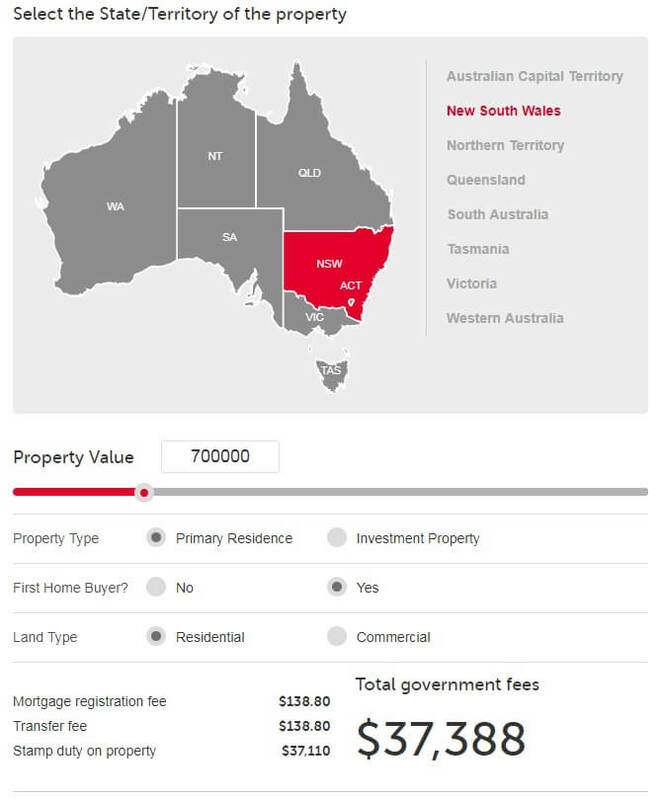 See the image - according to realestate.com.au NSW First Home Owners need to pay more stamp duty than others. What a waste! If you are a first home buyer you might eligible for assistance grants or a stamp duty concession. Check the links on this page for the respective state’s information. Keep in mind that there are more costs to buying a home than just stamp duty and the cost of the house. Loan application fee and mortgage insurance add to the cost of the home loan. For a loan of $300,000 approximately $17,000 will be spent on additional fees. Stamp duty is a tax which has existed for centuries in nations with English law. It is a tax that’s levied on documents. Traditionally , the documents were stamped as proof the duty had been paid. In the present day, physical stamps are not used. Transferring property from one party to another is an exchange that may attract stamp duty . That’s why it is owing when you purchase a home. The tax is paid because property is being passed from the vendor to the purchaser. It’s the purchaser of the property who must pay the duty . Though stamp duty is levied in all states and territories in Australia, it’s not a federally picked up tax. Each state and territory is answerable for managing the duty . Modifications between the guidelines and laws exist between each state, including diversifications in the way in which the tax is figured out. Purchasing a place for $300,000 in one state may thus need a different quantity of stamp duty to be paid than purchasing a home of an equal value in another state. Added to this, concessions might be applied to property purchases primarily based on whether precise conditions are met, and these rules differ between the states also. Concessions might be awarded under special circumstances like the receiver of the property being a 1st time consumer, and the value of the property being too low to draw in the duty . Though there are lots of differentiations between the states and territories, some critical likenesses happen. The basic system for calculation stamp duty is basically the same all across Australia. As the value of the property being transferred increases, the % rate used to work out the amount owing also increases. Each state has a minimum threshold so lower price properties avoid having stamp duty applied to any transfers in possession that will happen. This is to make sure that lower income earners aren’t unfairly levied with a tax they can not afford. There’s also an higher limit over that the rate applied stays the same. The higher limit is mostly around 1,000,000 greenbacks and the rate of tax applied can be more than 5 % once the price surpasses the higher limit. Each state and territory has their own Office of State Revenue that’s answerable for collecting the duty . Each Office of State Revenue ( OSR ) has its own site with recent info on stamp duty . If you want to find out any information regarding stamp duty , visit the internet site of your local OSR in the 1st example. If you don’t find what you’re on the lookout for and are still baffled about whether you’ll be needed to pay stamp duty on your next property purchase, talk to a professional mortgage consultant. A home-loan broker will be able to help with your questions and offer you contacts take a look into the issue further if needed. Home loan brokers customarily stay alongside of all of the latest stories and rule changes concerning stamp duty and therefore are an excellent source of info.